Sushant Gupta: What is Credit or Debit Card ? How does it works ? What is Credit or Debit Card ? How does it works ? Many people wonder what exactly is credit or debit card ? How it works ? How we can transact money from any ATM all around world ? What is MasterCard or Visa ? I will answer all these questions in this post. Being a 10th grade student, I won't be able to give you excessive details about this. Credit, in the most simple term, means providing someone with resource in form of money, capital or finished goods with an agreement to pay back the amount to settle that transaction with or without interest. Different banks have different arrangements and Rates to offer credit. Credit cards are a way to get credit from your bank or other financial institution. Once you use your credit card to avail a transaction of say ₨ 2000, then the banks will keep a record of the credit taken by you and charge you interests in form of monthly or annual bills. Debit is just the reverse of Credit. It means to provide someone with resource in form of money, capital or finished goods with an agreement to pay back the amount to settle that transaction with or without interest. Your ATM cards that you use are Debit cards. When you use a Debit cards, your bank provide you a Credit amount that it deducts from your bank account. A few banks charges you on the use of Debit card but most of them not. A debit card also called a check card one way gives you access to your bank account to withdraw money or transfer it. How are Credit and Debit card internationalized ?? No banks in the world can setup ATM all over the world. Then how can we transact money from any ATM around the world ? The answer is quite simple. There are international company such as MasterCard and Visa that provide you with Credit and Debit card. These companies issue Cards to all major banks who in turn provide them to their customers. The Banks have to registered with these companies to get cards. One we transact money from any ATM, the bank that issued the card is charged for the amount transacted. The Bank has to pay a very small amount on each transaction even less than 0.25 on a transaction of say ₨ 2000. This small amount add up to make huge profits for these international companies. This transaction charges may or may not be taken from customers. In India, ATM annual fees is Rs. 100 in Govt. bank and Rs. 500 in private bank. One more thing to remember is that though cards are offered by Visa or MasterCard, ATMs are set up by Banks. If you transact money from ATM set up by any other bank and not your bank you are charged certain amount by the bank based on your transaction amount. This charge varies from region to region. That is why ATM try to attract people by accepting all the cards. 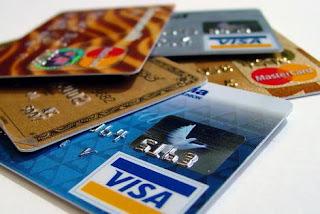 What are the Major companies offering Credits and Debit Cards ?? Visa : A huge multinational corporation head quartered at San Francisco. This company has successfully set up its branch in all major companies and is one of the major issuer of cards in India. Issues both Credit and Debit Cards. MasterCard : A US company. Internationalized company offering both credit and debit cards. Have over 25000 financial institution under it. Maestro : Debit cards operated under MasterCard. Only issued by selected SBI and Citi Bank and others. American Express : Popularly known as AmEx. Offers only Credit Cards. Discover : Primarily Issued in United States. Issues only Credit Cards but will soon offer Debit Cards. eMoney is a popular service available on the Internet. Whenever you enter you Card details on any website it connects to a Secure Payment Gateway such as PayPal and transacts money from your bank account. To make this more secure nowadays Major Corporation use certain code that is not available on the card and is only known to the owner of the card to prevent frauds. MasterCard provides Master Code, a secure password to accept transaction and Visa uses Verified by Visa, a 3D password to secure transactions. If you have correctly entered the password then it will connect to your Bank's server and transact required amount.